Dogs are creatures of instinct, so they have no idea that everyone isn't utterly charmed by their barking. Help your pet be a good neighbor with these tips to keep it from barking in your Springs luxury apartment home. Help! My Dog Won't Stop Barking! 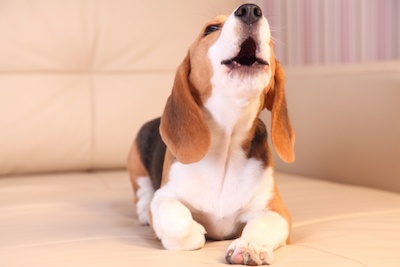 Barking is rarely a random activity, so identifying the cause of your dog's excessive barking is a key to which training method you should use. Some dog breeds have an abundant amount of energy. If that's the case with your pet, give him time for regular physical activity, especially outdoors where he can be as energetic as he likes. Why not start the day with a lively outing at our convenient on-site, leash-free dog parks? Your dog may simply get bored when you're not around. There are a couple of different solutions to this problem. Have a variety of entertaining toys on hand. Challenge him with Kong's interactive toys or create your own DIY version by cutting a two-inch slice in a tennis ball and filling it with treats. Keep the TV or radio on when you leave. The sounds will have a soothing effect on your dog. If you use a radio, choose a talk station so your pet can hear human voices, which is the closest thing to you being there. Scampering squirrels and other outdoor activity can catch a dog's eye and trigger a barking spell. If your dog is easily excited by the outside world, close the blinds or curtains and remove the distraction. 4. Create a "Quiet Zone"
Some dogs have a temperament that responds well to crate training. The crate or cage should be designed as a retreat, not a punishment, so your pet will perceive it as a pleasant place to be. Include a blanket or mat along with a pillow or two and some favorite toys. If your dog is resistant to a crate, try designating a specific room as his area. Reinforcement training is a classic way to induce positive habits in dogs. One technique is to simply provide treats as a reward when your dog stops barking. He will eventually recognize that silence is the preferred behavior. Another method is to reinforce an alternate behavior. For example, when your dog starts barking, toss a treat onto his mat or bed and tell him to go there. After a while the behavior will become automatic. Sometimes even your best efforts are not enough. In that case, enroll your pet in sessions with a professional trainer who has extensive experience in working with all breeds and temperaments of dogs. Want to spend some quality time with your well-behaved dog? Take him for a fun outing with other pets and their humans at our dog park, then finish with some TLC at our pet spa area.